A satirical view of travellers on Brixton Causeway with a passing man on horseback losing his hat and a plump gentleman on foot. 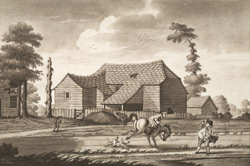 In the 18th century Brixton was largely wasteland, with the main settlement at Stockwell and with small isolated outposts in places such as Brixton Hill. A ribbon of industrial development slowly developed along main roads such as Brixton Causeway, but the proper suburban expansion of the area had to wait until the 19th century, when the opening of Vauxhall Bridge in 1810 improved transport to central London.